International arrivals to the Bahamas grew by 15% in JAN 2019 versus the same month in 2018, with several key markets registering double-digit growth, reports flight analysis company ForwardKeys. It was the highest number of international arrivals ever, resulting in record hotel occupancy levels. In FEB, international arrivals increased by 11% year-over-year. Overall air capacity grew by 20% in JAN and 21% in FEB year-over-year, with a 12.7% seat growth from Canada and a 23.9% increase from the U.S.
Last year was a record-breaking year for cruise ship and stopover arrivals. By the end of 2018, international air and sea arrivals totaled over 6.6 million visitors, a drastic increase from the 6.1 million recorded in 2017. Stopover visitors alone had increased 16.7% in 2018, as compared to 2017, and Freeport saw a surge of sea visitors by 49%. 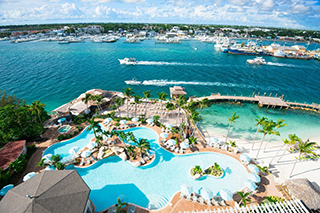 The Nassau and Paradise Island hotel industry reported a spike in average daily room rates and revenue per available room in 2018 compared to 2017. The year ended with room revenues up 34%, gains not seen in the past 10 years. At the beginning of 2019, the Bahamas Ministry of Tourism & Aviation launched a new brand campaign highlighting the beauty and authenticity of its 16 islands in partnership with musician Lenny Kravitz, urging travellers to “Fly Away” to The Bahamas. The Ministry also announced exciting plans for the development of a state of the art cruise port in Nassau.